1. Could Clippers Get On Track For Playoffs? Forgive Los Angeles Clipper fans for getting excited -- they're still trying to figure out if the Blake Griffin Effect has any limits. The B.G.E. has already accomplished the impossible within the space of a few months, turning the Clippers, the NBA's real-life Washington Generals, into must-watch TV. For most of their 27 seasons in Los Angeles "It's the Clippers" has been shorthand for freak injuries, terrible ownership, bungling management and embarrassing play -- suddenly "It's the Clippers" means youth and athleticism, dunks and breaks, and -- more recently -- wins. Griffin hasn't flinched from the team's losing legacy, announcing in a locker room interview after the recent victory over the Heat that "you can't come [to Staples] and punk" the Clippers anymore. He could have said "Good teams compete at home" or "We always expect to win." "Punked" connoted an acknowledgement how the rest of the league often regards the Clippers -- as an automatic victory, half a day off ... a team you could punk. With the return of Baron Davis and the continuing emergence of Eric Gordon and DeAndre Jordan, the Clippers have been among the NBA's hottest teams the past month. Despite starting 1-13, the Clippers finished Thursday evening 16-26, seven games out of a playoff spot after 108-93 road loss to Portland. And -- even though they know it's premature -- it's got Clippers fans wondering. Could this team make the playoffs? Well, the Clippers have certainly been playing inspired basketball. Going into the Portland game, the Clippers had won three in a row, six of their past seven, and 11 of their past 15, a streak that included wins over the Heat and the Los Angeles Lakers. In recent seasons, when 50 wins was the benchmark for playoff teams in the West, the idea of a 16-26 team making a run at the playoffs would have been laughable, but 41 or 42 wins might easily take the eighth spot this season, especially if the Nuggets do eventually move Carmelo. The Clippers are as talented as any of the teams battling for the West's final spots. Baron Davis, suddenly surrounded by young, explosive talent, and buoyed every night by a suddenly passionate Staples Center crowd, is finally playing the kind of point the Clippers always hopes he would, a point guard who can score, but doesn't need to. When Griffin went for 47 against the Pacers, it was mostly Baron on the other end, racking 12 assists without a turnover. According to Basketball-Reference.com, Baron-Gordon-Gomes-Blake-Jordan are a +6.83 per 100 possessions. That's the 11th best starting unit in the league for lineups that have played 200 minutes or more. Plus, the Clippers hope that the return of Chris Kaman, who has been out most of the season with an ankle injury, will provide instant offense for one of the league's least productive benches. But is it good enough to make the playoffs? Probably not. Historically, a 1-13 start is all but impossible to overcome. According to Elias, only the 1996-97 Phoenix Suns have started a season as poorly as this Clippers team and gone on to make the playoffs -- and the Suns made it in with a 40-42 record. With seven teams still in the mix for the West's final playoffs spots, it is unlikely that anyone will sneak in with a losing record. The last time a team started 1-13 and finished .500 or better? The next time will be the first. History isn't the only thing that makes a Clippers run unlikely. The Clippers have played fewer games on the road (16) than any team in the NBA. Their recent hot streak has taken place mostly at Staples Center, with eight of the 11 wins coming at home. Currently, the eighth spot is occupied by the Portland Trail Blazers. The Clippers play 25 of their final 40 games on the road. The Clippers have already played many of their toughest home games, and with only four playoff teams in their final 12, it's reasonable to think the Clips could continue to play well at home. But even if the Clippers win nine of their remaining home games, they would have to go 13-12 the rest of the way on the road, a daunting task for a team with only three road wins in their first 16 tries. As an additional degree of difficulty, the Clippers will spend three full weeks in February on the road; the 11-game trip is the longest road stretch scheduled in the NBA this season. The front end includes a brutal four-game stretch with visits to Atlanta, Miami, Orlando and New York. A four-game losing streak there would end any playoff chatter pretty quickly. The biggest obstacle, however, is the number of teams between the Clippers and the final spot, any of which could realistically get in. Even the Suns -- who only a few weeks ago seemed like they were teetering on the brink of a lost season -- have steadied the ship, as Steve Nash figures out how to make yet another group of guys work together. Golden State is a few games ahead of the Clippers, but their remaining schedule is as good as the Clippers is bad, with the most remaining home games. Despite their recent play, the Clippers are still mired in 13th place in the West, ahead of only the Sacramento Kings and Minnesota Wolves. Realistically, the playoffs are not in the cards for the Clippers. The loss Thursday at the Rose Garden to the Blazers was a reminder of how difficult it would be for a young team to play winning ball on the road the rest of the season. Playing for the fourth time in five days, without the energy of the home crowd to get them over the hump, the Clippers were slow to rotate out to shooters, and struggled to contain the Blazers. For now, Clipper fans should enjoy the continuing emergence of a young core -- and of the star who won't let them get punked. The game was billed as a battle between two MVP candidates: Derrick Rose of the Chicago Bulls and Dirk Nowitzki of the Dallas Mavericks. Bah. I hate that kind of talk. Unless I accidentally skipped a chapter of NBA history, the MVP has never been awarded in January. It's a meaningless discussion. It's also irresistible. The game was one of those ugly defensive battles that evoked unpleasant memories of those Heat-Knicks scrums from the late 1990s. Both teams finished with a field goal percentage in the mid-30s. Nowitzki managed 19 points on 6-for-16 shooting and grabbed only two rebounds in 38 minutes. Rose scored a game-high 26 points, but it took him 28 shots to get there. He went 5-for-20 in the second half. I've watched every game Rose has ever played. I've seen him have bad shooting games, but this was different. The Dallas D covered him like a blanket made out of barbed wire. I can't remember a team playing better defense against Rose. Of course, the Mavs could afford to throw waves of defenders in his path. Carlos Boozer and Joakim Noah were out. A weary-looking Luol Deng -- as of Thursday, he's logged 40 minutes or more in 11 of the past 16 games -- went 3-for-13. At times, it felt like one-on-five out there. Of the nine Bulls players who logged PT, Rose was the only one to score in double figures. And get this: He had double figures (10) in the fourth quarter. His brightest moment came with 55 seconds left in the fourth. With the Bulls up a point, Rose nearly lost the ball in the paint before backing it out, throwing a few one-on-one moves at Jason Kidd, and then beating the shot clock with a 19-footer that gave Chicago an 80-77 lead. ... makes talking about Rose winning the MVP feel kind of right. • Read more from McHale in the Bulls By The Horns blog. Zach Harper, TrueHoop Network bloggers and fans gave their pre-, in- and post-game opinions in Thursday's Daily Dime Live. 4. Will Miller Become Fourth Heatle? MIAMI -- It was the freakiest of freak injuries. On Oct. 20, just six days before the Miami Heat's opener at the Boston Celtics, Mike Miller was wrestling with LeBron James down on the block. The Heat are renowned for the intensity of their practices. Throw in the responsibility of guarding James, and Miller had his hands full -- literally, as it turned out. "I was just guarding LeBron in the post," Miller recounted. "He spun to make a move. I kind of got my thumb caught in his jersey and it just popped. It came all the way back and I felt it and I knew it was gone. It was bad. I can usually play through stuff, but I knew it was going to be a problem. I just walked off." Miller suffered serious ligament damage to his right thumb. The Heat, who feature an aging roster of role players apart from their three superstars, were suddenly without their fourth-best player. Miller was fitted for a brace and began shooting again just after Thanksgiving. He tried to remain in game condition, fully aware that, for professional athletes, no workout regimen can simulate the demands of live game action. • Check out the rest at the Heat Index. D.J. Augustin, Bobcats: Posted one of the great halfs of the season, sinking 10-of-11 shots en route to 25 points, finishing with a career-high 31 points overall in the Cats' 100-97 win over the Sixers. Mavericks' bench marksmanship: In a game most notable for defensive play, four bench Mavs combined to shoot 8-for-28 (28.6 percent) in the loss. -- Mavs owner Mark Cuban, throwing open the doors! You heard the man, be there or be square. Oh, wait, it's invite only. But all is not lost -- a previous tweet says you can still win an invite. "It's just a dirty little creek." -- TNT analyst Charles Barkley, taking aim at San Antonio's fame "Riverwalk." Question: Who has been the best coach of the past decade? BUCHER: Two coaches have stood above the rest of the NBA during the past decade: The Lakers' Phil Jackson and the Spurs' Gregg Popovich. There are coaches who have been impressive in various ways -- the Jazz's Jerry Sloan and the Celtics' Doc Rivers immediately come to mind -- but they are, at best, fighting for a distant third. The question is, who deserves to be considered the best? I'm going to go with the man they call Pop. BROUSSARD: Obviously, Pop is a terrific coach, one of the best to do it. But my pick for coach of the past decade or so is Jackson. With five titles and seven NBA Finals appearances since 2000, he's led two separate dynasties in one decade. Not only has Jackson been the best coach of the past 10 to 12 years, he's been the best in NBA history. RB: That was my initial thought, too. Who argues against all those rings? Jackson's five versus Pop's three since 2000, right? In fact, I'd be willing to concede that Jackson is battling Red Auerbach for best of all time when you include Jackson's Chicago run. But when I look at what he's working with, and where and for whom, this feels like a race in which one runner has a 10-yard head start every time. The Los Angeles Lakers' winning has never come as a surprise; in fact, when they've lost, it has been an upset. The San Antonio Spurs, on the other hand, have been the favorite very few times because their talent never warranted it. Yet every season, including this one, they win more games and go deeper in the playoffs than their pure talent says they should. If you measure strictly by results, there is no argument here: Jackson wins. But measure results against what they were working with, and Pop clearly has "coached up" his teams more consistently than Jackson has. 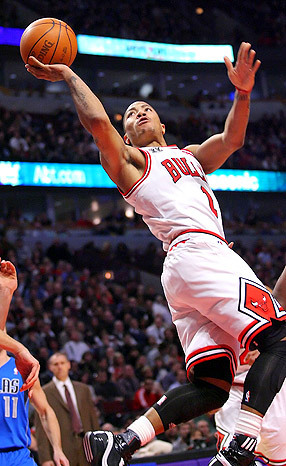 Bulls point guard Derrick Rose lifted his team to a win over Dallas. Chicago's 29-14 record is the fifth-best in the NBA, third in the East. Chicago is now one game behind Miami in the East standings. It wasn't pretty, but Derrick Rose led all players with 26 points despite shooting only 9-for-28 from the field in the Chicago Bulls' 82-77 win over the Dallas Mavericks. It was the third time this season that Rose missed as many as 19 field-goal attempts, something no other Bulls player has done even once over the past seven seasons. The only other players to miss 19 or more FGAs in a game this season are Kobe Bryant (four times) and LeBron James (once). But what made Rose's performance most unusual was the fact that no teammate scored even 10 points. Over the past 10 seasons only two other teams won a game in which just one player scored in double-figures: The Cavaliers, behind a 37-point night by LeBron James three years ago, and the Lakers, with a 62-point performance by Kobe Bryant in December 2005. The Bulls had only one other such victory in team history, behind Michael Jordan's 45 points against the Sonics in 1997.